Several months ago, Cleveland police attacked a crowd that attempted to unarrested a young teen outside of a Black Lives Matter conference. 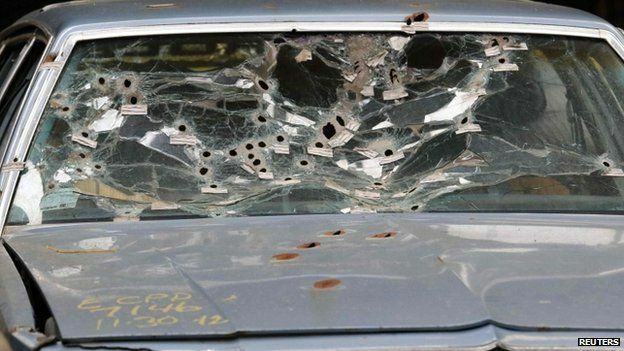 The resulting standoff highlighted increasing tensions in a city that had already been brewing with anger at the police following the murder of Tamir Rice and the acquittal of Michael Brelo, a 31 year-old white patrolman who stood atop the car of two unarmed African-American motorists and fired into their vehicle 15 times, after other officers had already riddled it with bullets. In this interview, author and anarchist strategist Tom Nomad discusses how the last few months in Cleveland have played out and the dynamics leading up to the upcoming Republican National Convention (RNC). It’s Going Down: In July, police in Cleveland made the news pepper-spraying a crowd outside of the Black Lives Matter conference. What exactly went down? What was the reaction to the police? Did their reaction surprise you? Tom Nomad: From what we have come to understand, and the videos are very difficult to decipher, a 14 year-old boy was hanging out in a bus stop along a strip that we call the Euclid Corridor, an area that runs down Euclid Ave between downtown and the area around E120th St.
From there, the incident began with the RTA (Cleveland Transit Authority) cops hassling this 14 year-old African American male at one of the stops on the Corridor, directly in front of Cleveland State University, where the conference was being held. It just happened that the proceedings of the conference were in the middle of a down time, and several attendees were hanging out outside of the building and saw the actions of the RTA cops. As people began to stream out of the building, crowds started to gather around the incident. 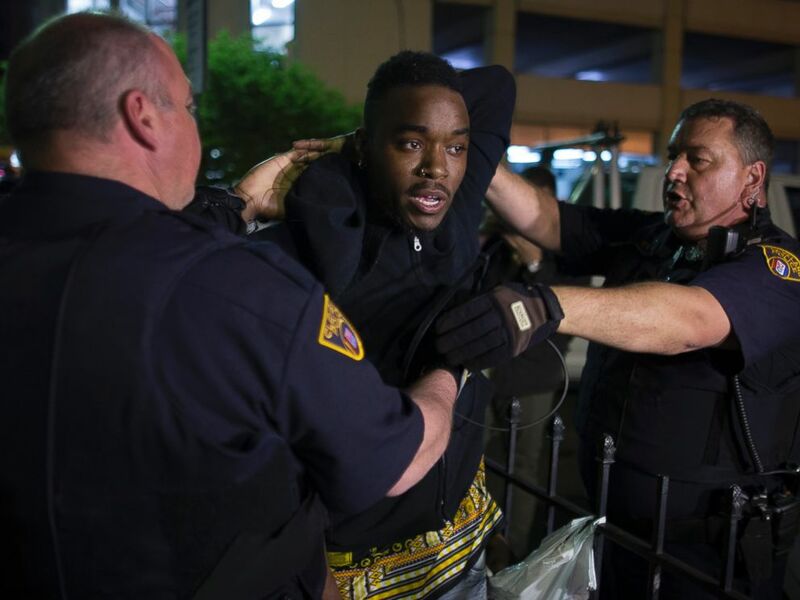 With the gathering crowds, the cops on scene started to get agitated and confront the crowd, as they bundled the arrestee into the waiting police car. The situation escalated and people took over the street in both directions and stopped the cops from leaving the scene. When the cops noticed that they had been surrounded they began to push into the crowd, which escalated the situation. Some of the people in the crowd convinced some of the participants in the action to back off from the cops, but not relinquish control of the street. 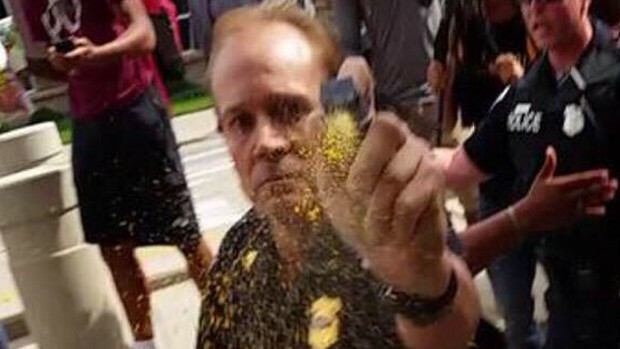 It is at this moment that the cops began to pepper spray the crowd, spraying in all directions, hitting a number of people in the front, who were promptly evacuated to the back and subjected to an eye wash. This failed to actually push people from the street, and escalated the situation further. Someone in the crowd got the name of the arrestee and tracked down his parents, called them, and told them what was going on. An ambulance showed up and the arrestee was taken from the police car, uncuffed and put into the ambulance. When his parents showed up the EMTs released him to his parents and the situation deescalated, with the cops eventually leaving the scene. This area has a reputation for confrontations exactly like this one. All down this strip the city evicted small businesses, and gave subsidies to a series of what they call “cornerstone businesses.” Then they poured around $2 billion into the strip down Euclid to build bus lanes down the middle of the street and install dozens of cameras, both on the poles above the stops and on the buildings lining the strip. The strip runs right through the middle of one of the poorest neighborhoods, Hough, in the whole city, and a neighborhood with a history of civil unrest. What has resulted from the Corridor project has been what essentially equates to a dead zone, an area that is heavily policed, that no one from the surrounding neighborhood really goes in to. When people from the neighborhood, or any people of color for that matter, go onto Euclid there is a high likelihood that they will be stopped, searched and detained for a period of time. It is in this situation that we have to understand what happened outside of the Black Lives Convening Conference. The other factor to keep in mind is that even though the Corridor is fully within Cleveland Police operational territory, it is also wholly patrolled by the Rapid Transit Police, the transit cops, who are under the control of the Rapid Transit Administration, and by extension under control of the county government. The RTA cops have a history of brutal responses to minor incidents. It is not rare to hear of the RTA cops tasering someone simply for jumping a turnstile or disobeying their commands. With everything that has happened the RTA cops have largely escaped scrutiny until this past incident. The police reaction to this incident is not surprising, for a couple primary reasons. 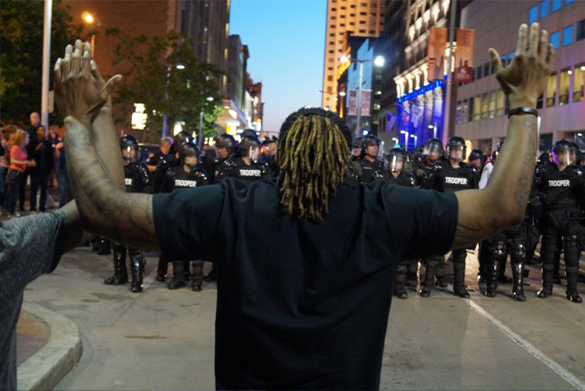 The dynamic in Cleveland has changed after the demonstrations and confrontations with police following the Michael Brelo verdict. Brelo was on trial for his involvement in a police chase that resulted in a car being shot 137 times, and the death of both of the occupants of the vehicle. Brelo was specifically charged with jumping on the hood of the car, after the initial barrage was finished, and pumping a magazine and a half into the bodies of the driver and passenger. Before the verdict the tactics being employed by the police can be best described as passive containment, sitting back in a perimeter around a march, and allowing the action to generally burn itself out. Even early on, after the murder of Tamir Rice, when people were shutting down freeways and disrupting City Council meetings every week, there were no arrests, and a generally passive approach. The goal here was clear, to not allow for the situation to escalate out of their control and to channel all action into singular, controllable, spatially limited actions in the downtown area, where the population tends to be wealthy and white. IGD: What happened in Cleveland when police officer Michael Brelo was found not guilty? Tom Nomad: During this time more consistent organizers were being surveilled, but at a distance, with the occasional infiltrator in actions and unmarked cars outside of meetings. But, even in this situation, the surveillance occurred at a distance, and never crossed over into people being approached or raided. There were some moments in which the facade of passivity would crack, such as during some of the confrontations in November when a bus of people from Ferguson came to town, but these moments were the exception rather than the rule. It is important to keep in mind that there is a general recognition in the city that the anger over police action extends far outside of the ones that turn up to demonstrations, and the actions of the police were clearly engineered to maintain a distance between those that are on the street and those that have not come out yet. This distance is constructed both spatially, with the confining of actions to the downtown area, and organizational, with a series of organizations all competing for power over the phantom of a singular “movement”, which always exists in concept only. In the lead up to the demonstrations around the Brelo verdict the tactics of the police began to take a stark turn, although this was not apparent to many at the time. 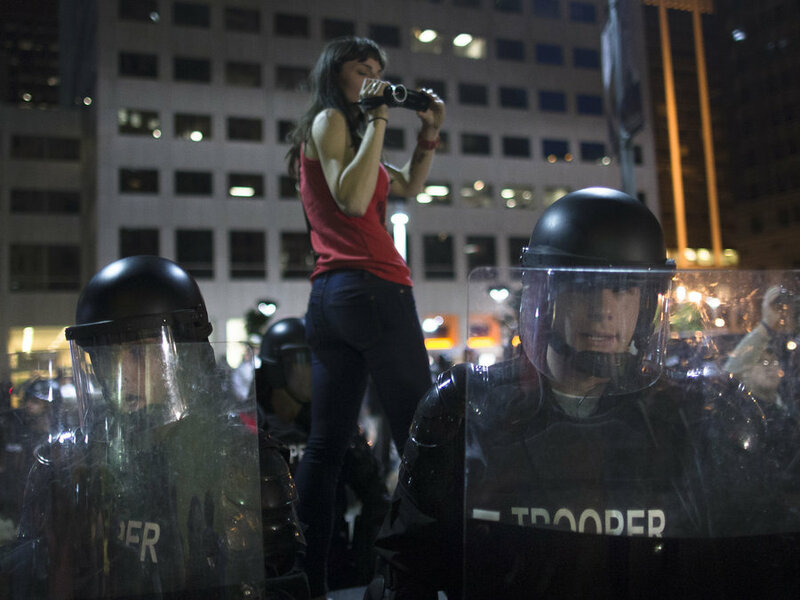 Starting around a month before the end of the trial the city began to organize city sponsored “peacekeeper teams”, who were ostensibly being brought on in order to be a liaison between the cops and demonstrators after the verdict, and just as pacifists tried to do in Ferguson, deescalate the situation. The “peacekeeper teams” were organized on a district by district basis, with the police district public relations staff doing the organizing on the surface. The composition of these groups can only be understood in relation to the dynamics of the city political machine, which has been a form of Democratic Party controlled cronyism for the past 70 years or so. This led to the building of the “peacekeeper teams” from those that exist within four distinct spheres within the social dynamics of the city. The first sphere is comprised of those that are already close to the police department, including auxiliary police and neighborhood watch organizers, as well as people from the Citizen Relations Boards for the district, and CMHA, the Cleveland Metropolitan Housing Authority. These are people that derive a significant amount of power within the political dynamic simply through being more or less snitches and security guards at public events. The second sphere in which they drew participants was from city affiliated non-profit organizations. Many of these organizations, like the Guardian Angels and Peace in the Hood, front as organizations that are attempting to be community conflict resolution organizations, but in reality often become nothing but an informant network for the police; this key group I will discuss in more detail later. The third sector that participants were drawn from were the churches and other “community organizations”, like the Community Development Corporations. Finally, they were drawing participants from the police departments themselves, who often dictated the pace and content of the meetings and set the tone for the activities of the “peacekeeper teams”. What became profoundly disturbing about this structure is that these non-profit conflict resolution organizations, who often are involved in mediating conflicts between street gangs and so on, were shown for what they actually are: informants. During these meetings the infiltration of demonstrations and organizations was openly discussed, and information gained from these operations were clearly discussed. Outside of the use of the formal non-profits and “community organizations” to monitor social media for rumblings of civil unrest, the conflict resolution organizations were setting up meetings with people in street gangs and some organizations and trying to gather information for the police. From this information the goal was to identify “troublemakers” and target them for arrest during any actions that may arise from the verdict. This dynamic, which essentially equates to the construction of a low level secret police informant network, was exposed to some people in the media, after which the meetings were closed and started being held in relative secret. Also, in the week leading up to the verdict we began to get word of a series of preparations that were being made by police departments around the county. There were reports of cops from surrounding cities being put on 12 hour shifts and having their vacations called off. Reports came in of trucks pulling up and off-loading large quantities of boxes at the Police Academy. Most strikingly, there were reports coming from within the city bureaucracy that the verdict was being held up until the police department could receive their shipment of riot control gear. It also became clear, as the week wore on, that Burke Lakefront Airport, an airport for small private planes bordering Downtown, was becoming a hive of activity; this would become the eventual staging area for the police operation and holding area for arrestees. When the verdict was released, on a Saturday morning at 10 AM, it came as a surprise. There had been talk coming from the city all week that they were going to provide warning of the verdict hours in advance, which they failed to hold to. Almost immediately people began to gather around the city, with some beginning to gather Downtown, around the county jail, some gathering out on the west side of the city, near the house of the county prosecutor, at a demonstration that was already planned for that day, and others beginning to gather at houses around the city to gather supplies, organize the medic and scout teams, and set up logistics for the day. In the minutes after the verdict we began to notice that helicopters were hovering over a series of neighborhoods, with reports coming in that they were circling around Detroit Shoreway, a neighborhood home to many of the anarchists in the city, over the West 80s, a neighborhood immediately bordering Detroit Shoreway and where Tamir Rice was killed, and over Hough, Fairfax and East Cleveland on the east side of the city. From the reports coming in from the Downtown area riot police were beginning to gather near the crowds that were starting to form. Around this time, now 11 AM, marches began Downtown, with the main group heading around the center of the city blocking roads, and eventually crossing the Detroit Superior Bridge to the west side. This march moved up Detroit Ave from W25th to around W40th, where there is a large open field separating the street from a freeway. At this point the crowd ran through the field, jumped onto the freeway and blocked the freeway. They eventually moved, after a tip that arrest vans were on the way to their location. The other group began the demonstrations at the prosecutor’s house, marching through the neighborhood, eventually ending the action and going to Cuddell Recreation Center. The group that was heading west on Detroit marched all the way down to Cuddell, which is around W90th St, and met the group from the other action. When the crowds met they began to move through the neighborhood and were met by a line of mounted police. After some brief scuffles the crowd moved back down Detroit, across the bridge and into Downtown again. It is at this moment that the situation began to escalate. 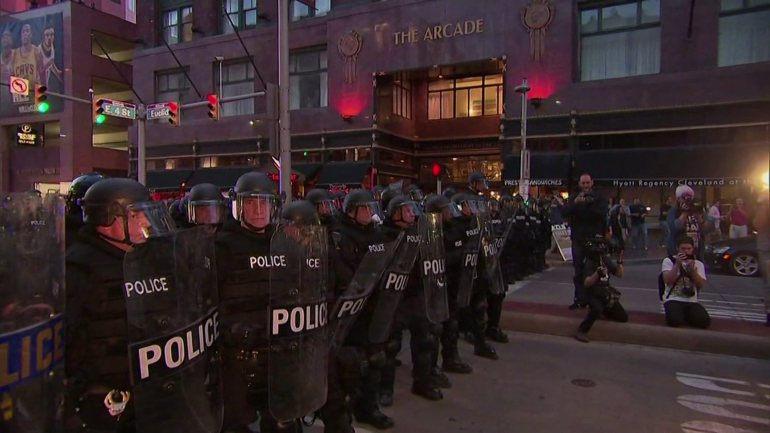 Most of the riot control units had been confined to the Downtown area. As the crowd moved through Downtown, and up East 4th St, a patron of a bar threw a drink at someone in the march and a fight broke out. The cops came storming in and arrested some of the people in the march, and pushed the rest of the march south of the location, into some of the crowds gathering for the baseball game that was happening that afternoon. The crowd began to march on the stadium, and were blocked by riot police again, who charged the crowd and pushed everyone north away from the stadium. At this point things became really tense, with people spreading out around Downtown, and ending up in a cat and mouse game with the cops. As the crowd began to centralize again there was a shift in police tactics. Firstly, a shift change had occurred, and the cops on the street were largely not sheriffs and state police, with many of the Cleveland cops being dispersed into the neighborhoods to watch for groups gathering and many of the out of town cops being rotated out. Secondly, the goal became to end the demonstrations, and prevent them from leaving the Downtown area. As night fell people from the earlier demonstrations had left and the group that was still in the streets was younger, more confrontational and less organized. This led to a series of small clashes, which culminated in an hour long attempt by the police to flank the crowd, get in front with buses full of cops, and funnel them into an area where large numbers of arrests could be easily made. This attempt culminated in the arrest of over 70 people, who were surrounded in an alley, boxed in and slowly arrested. After arrest they were transferred down to the abandoned high school, Aviation High School, at the airport for processing. Throughout the night, after the end of actions downtown, there were reports of small groups gathering in neighborhoods, some fires were set (although it is unclear whether this was related), the streets were saturated with cops and the skies with choppers. The reason that this level of detail is necessary in this explanation is that we cannot understand the shifts that have occurred in Cleveland without understanding some of the more nuanced dynamics of the pivot point, the late afternoon on the day of the actions around the Brelo verdict. Since this time we have noticed a marked shift in police response to potential points of confrontation. Take for example, around a week after the Brelo verdict the police fired shots at a man that was fleeing arrest in the West 80s, near where Tamir Rice was killed. Immediately crowds started to gather and assess the situation. The response was to bring in large numbers of SWAT vehicles and cordon off the entire area. Around a week after this they raided a building in the same area, and rolled down in a convoy of dozens of vehicles, immediately cordoned off the area and walked around the streets with automatic weapons out. This shift can be explained by the shifting dynamics on the streets of the city. Early on in this process the police worked to separate the organized groups from the neighborhoods, and were largely successful in this attempt. This, coupled with the general hesitancy to see what is happening in a strategic way on the part of many groups in town, has led to a dynamic in which, as we see with many formal political groups, the organized groups are becoming more and more isolated as they replicate the same activist tactics again and again. Some groups, like the New Abolitionists Association, have given up on organizing almost entirely, and have just become part of the process that the city has instituted. When this isolation became entrenched the tactics changed from one of containing “movement” organization to one of raising the stakes for those that fall outside of the self-defined “movement” groups, namely people on the street. These demonstrations of force, which have taken the form of saturation policing of potential trigger points, has been largely successful in presenting the image of calm. When we take this all into account another perspective becomes clear. The initial tactic was pure deescalation, hoping that the process that the city had set up to channel anger into political legitimacy would pay dividends. As it became clear that many of those that had been participating in actions had no interest in working with the city, and the groups that did had lost legitimacy, a more nuanced counter-insurgency strategy began to take shape. If we study US military counter-insurgency closely we can see a series of dynamics come in to play. Within occupation you have a situation in which the occupying force, and all police are an occupying force, have to cover as much space as possible as consistently as possible, and this takes dispersed force, movement and coordination; force projection. As attacks occur, or become possible, the occupying force has to concentrate forces, limiting their projection, resulting in gaps in coverage. Counter-insurgency, as it is currently understood in a doctrinal sense (which is separate from the concept on a more general level, all policing is counter-insurgency) attempts to amplify force projection through non-traditional means, coupled with police action. Sympathetic elements within a space are mobilized and given benefits in exchange for cooperation and information. The construction of a secret police informant network is used in order to gain vision into areas that would otherwise be opaque, by exploiting the trust that some have for the collaborators. From this information operations can be planned, with overwhelming force used in order to create the conditions for either the capitulation or elimination of insurgent forces. This is very much what we have witnessed building up in the city, the use of secret informants that operate under the guise of community organizations, the disbursement of benefits to those that cooperate, the attempt to identify antagonistic elements and the use of overwhelming force and shows of force to attempt to suppress resistance. On many levels we are our own worst enemy. The traditional way that radicals, and this is a dynamic that infects so much of anarchist discourse, interact with wider dynamics of conflict, is that we attempt to interact as anarchists, and in this allow political identity to become a central mechanism in our activity. In doing so we construct a space in which we enter into a frontal conflict with the state, bouncing from action to action, riot to riot, and acting based on immediate political will driven by anger and passion; this makes us isolated, and as a result, easy targets. This is combined with the use of social media and a conceptual understanding of surveillance to construct a situation in which we are also easy to track and monitor. All of this is wrapped up in a structure of activism, in which we attempt to engage with an enemy that we have no intimate understanding of, on a terrain which is symbolic, driven by an injunction to act whenever possible. These dynamics prevent us from being able to come to understand some very fundamental elements of the immediate terrain that we operate within, and leads to situations in which we are exposed, operating at a disadvantage, and replicating tactics that, even if they create excellent visuals, are largely ineffective. Take for example the concept of the march. In this structure of action we expend resources in order to create an event that in its very structure is isolated, some event that is done by some group for some purpose. Within this operational limitation the action itself becomes identifiable, easily visualized and spatially limited. The dynamic begins to form in which the march, even if some element of destruction occurs, is always hermetically sealed, controllable, contained, and often clearly within a zone of activity which is surrounded and potentially dispersed with force at almost any time. By replicating this scenario we are replicating a dynamic in which we always will have a disadvantage, and in which the immediate goals are unclear. Tom Nomad: In perspective, some of the preparations for the Republican National Convention have become abundantly clear. Primary among these is that we can start to see the police actions after the Brelo verdict as foreshadowing some of the tactics and logistics that will be used during the convention. For example, it is likely, given our past experience, and some of the information that we have been able to recently acquire, that Burke Lakefront Airport is going to be used as both the police staging area and the holding area for arrestees. It is a large open space, with ready access from highways, immediately outside of Downtown, and there is already experience in using it for this purpose. 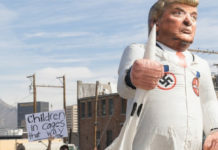 Along with the police response to the small demonstrations that happened around the Republican Debate, we can also reasonably predict that the tactics that will be used will likely be based in large riot lines and full gear, rather than the more dynamic mobile tactics that we tend to see in places like DC or later in the police response to the Baltimore riots. Specifically, what I expect to see is a continuation of the secret police informant network, and the use of this in the lead up to the convention. We already know that they are watching social media closely, and that locally based corporations are in touch with, and coordinating security operations with, the FBI and Homeland Security. With the continuation of this program, and the certainty of more formal infiltration attempts, there is a distinct risk in even attempting to organize anything at all. One of the dynamics of convention cities that is often not discussed is that for the residents of the city the convention begins the moment after the announcement. We have already been seeing the shift in city spending priorities, the attempt to build support around the convention and the disbursement of benefits to those that are willing to cooperate, the change in police tactics, training and equipment, and these dynamics will impact the city for some time to come. moment remains pretty constant. 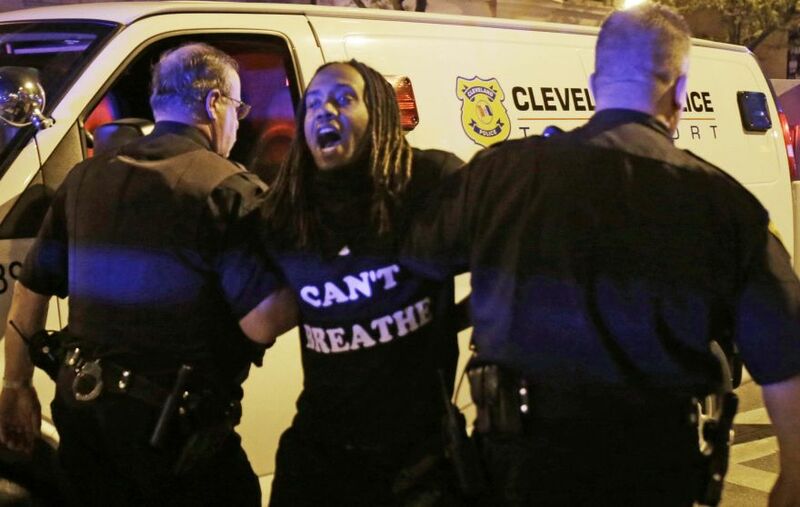 How are police departments in your view reacting to this, and what does that tell us? Tom Nomad: To begin to venture a response to this question, question of police tactics in general, there are a series of distinctions that have to be made and points that will have to be clarified to begin the entry way into a way to think through this question. Firstly, on a basic level it is impossible to speak of tactics in themselves, or in some generalized sense. When we speak of the tactical we are speaking of the dynamics of activity within a particular scenario. On this level we have to acknowledge the distinction between tactics and conceptual approaches that may be attempted. As such, all we can speak of is the ways in which we can make sense of tactics and the ways that this may come to inform an understanding of strategic approach. Within the question of strategic approach we also cannot speak in absolute generalities, strategic approaches vary from place to place, are impacted by dynamics of history, the internal dynamics of the force itself, which is never singular, and the dynamics of the moment, as well as factors like training levels, psychological approaches of command structures and so on. In this sense, all we are really capable of doing is speaking in a highly generalized way to the degree that a general response to a question like this is possible. Secondly, we have to clarify what it is that we mean by the term “police”. In modern American etymological approach we tend to approach the police as a group of people in uniform that impose laws through a certain logistical structure. However, I would like to broaden this term into its more foundational roots, as those that impose the conceptual structure of the state, that impose unity, through a variety of means centered around a use of force. What is important about this broadening out is that from this perspective we are capable of making sense of more than just what a particular institution is engaged in, and what the dynamics of that grouping may be. We can begin to think through political dynamics, the use of irregular forces, which is highly important in so-called “community policing”, and the dynamics around space. Specifically, and this is relevant in our ways of thinking through responses to the current crisis, we have to think through the ways that the actions of police professional organizations (the FOP, PBA, PA, and so on) both serve to reinforce certain approaches while undercutting others. In the age of police militarization and the backlash against police activity the professional associations have become increasingly powerful. So, with these caveats out of the way there are some basic approaches that can be outlined, at least in a very general way. 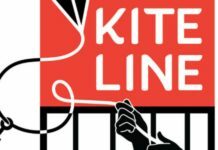 These approaches can be loosely grouped around a structure that is likened to the modern manifestations of counter-insurgency that we have been seeing develop in the US occupations of Iraq and Afghanistan, and that are now spreading out into a more comprehensive global military posture. We have to keep in mind here that this discussion exempts the initial police response to the demonstrations in Ferguson, where overwhelming force was used from the very beginning of engagement. Rather, a turning point occurred when the State Police came in and took over the operations. At this point we began to watch a dynamic build up, where the initial goal becomes to deescalate a situation by providing a controlled, contained space for actions to occur within. This containment can take the form of a perimeter or a curfew or both. In this space actions are allowed to continue, but the perimeter is tightly closed and secured, with actions that occur outside of this space being cracked down on. This perimeter is not necessarily static, it moves, as we have seen in actions in Cleveland and other cities, where marches are able to take roads, but contained with traffic routed around. The goal here is twofold. Firstly, it is to not be the flashpoint, to not escalate force and to not create a dynamic of open fighting. Secondly, the purpose, on an immediate operational level, is to contain contingency, to provide a reason to go into the perimeter, while discouraging any exit from that space. This tends to concentrate actions in easy to contain and limited spaces. This containment then spreads outside of the immediacy of street action, and begins to take the form of a much broader containment which comes to impact approaches to strategy. In the Cleveland context this meant that the city government found organizations that had either something to gain through collaboration or something to lose by not collaborating, in this case it was moderate youth organizations, like the New Abolitionists Association, and church organizations, who have been forces of collaboration and deescalation since the 1960s. At the point in which some organizations can be pulled into the process the dynamics shift. These organizations are often given easy, but generally meaningless and symbolic, victories that they can use to recruit new members and channel resistance into acceptable channels. While this is occurring we have witnessed a process through which the tactics employed by the police become more and more frontal, with the number of arrests increasing, and street action being increasingly compressed and limited. This strategic arc creates a dynamic in which the options become clear, one can collaborate and maybe gain some symbolic ground within a reformist framework, or one can become increasingly isolated within a context of compressed spaces of action. This strategy has a certain functionality, but this functionality exists only in relation to a certain form of engagement, namely a form of engagement that is based in reformism and activist frameworks and modes. In other words, this is a strategy that functions to the degree that conflict is understood as occurring on a conceptual plane in relation to a conceptual enemy, and that this occurs within a conceptual framework of incrementalism, what is sometimes called “acceptability politics.” Another dynamic that is causing issues for this strategy is the approaches that have been taken by the police professional associations across the country, which has been a posture of total obstruction, complete opposition. What is important about this antagonistic stance is not so much that the police are attempting to preserve a certain role based in impunity, this will necessarily always be the case; the police are the condition of possibility for the state, for law to function. More importantly, this approach has generated a political crisis in certain areas, specifically in larger cities, in which it becomes impossible for the strategy being employed on a political level to come to fruition. Without being able to provide benefits for collaboration, albeit limited and incrementalist benefits, the impetuous to collaborate disappears and the forces that engage in collaboration cease to have any relevance on the street. In other words, without the ability to demonstrate some level of success there becomes little reason for others from the outside to be channeled in to a structure of collaboration. 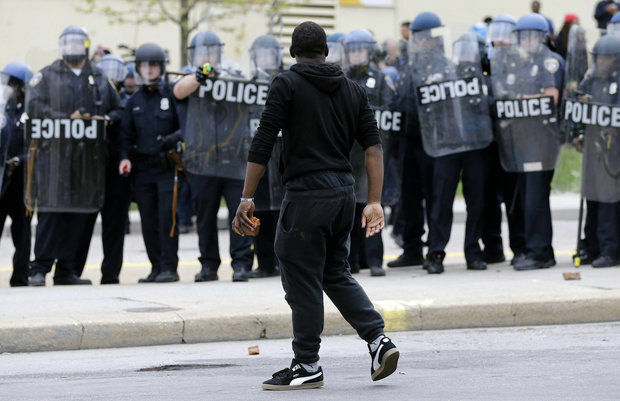 We can see numerous attempts to address this, with cops being charged in Baltimore quickly after the rioting began. 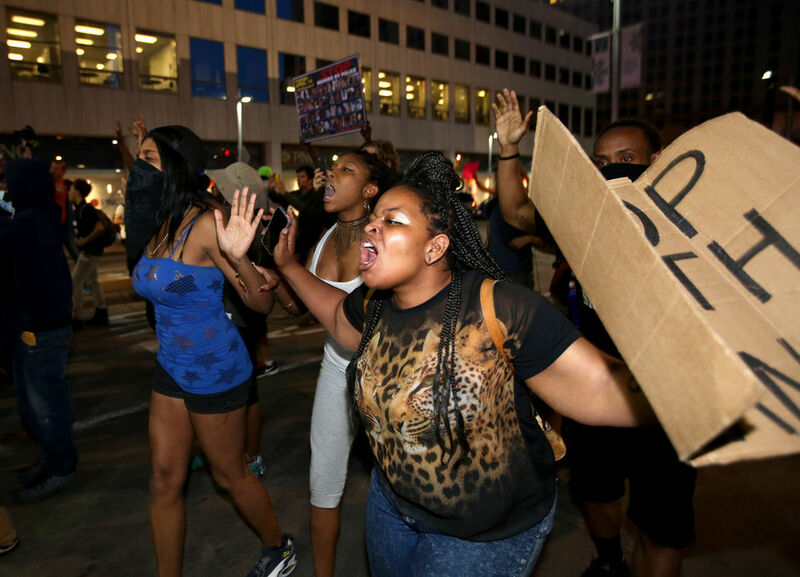 But, for as often as these acts of desperation are being taken in an attempt to salvage the viability of this specific strategic approach, there are even more examples of this strategy failing, less due to outside resistance, and more due to internal dissension; we can point to Ferguson police firing tear gas into crowds after the non-indictment of Darren Wilson in contrast to direct orders from the State Police as a clear example of this. What is going to become interesting is not the question of whether this strategic arc will implode on some sort of “national” scale, this is a false category, the category of the nation as some sort of singular unit. Rather, what is going to become interesting is whether, on a localized and immediate level, in some particular terrain, what the dynamics of this sort of strategy collapsing will inevitably be. On a basic level—on the most general level that is able to be commented on, a conceptual level—the question will be how this tension is negotiated, how political structures will cope with being under siege, both on the street and by their protectors, the police themselves. It is this dynamic that, on a very immediate level, generated many of the dynamics within the social war that have led us to a point in which there is an increasing sense that fighting is a viable option, and it is this dynamic that in itself will continue to perpetuate this specific dynamic. IGD: In places like Cincinnati and Baltimore, police departments were gearing up for riots months before hand as they prepared to release footage of police shootings and potentially exonerate officers facing charges. Do you think things have shifted in terms of how the state sees potential insurgency and riots in the US since Ferguson? Tom Nomad: When this shift has been discussed, at least in the discussions I have seen thus far, the discussion tends to come from a discourse based on some sort of immediate presence, and the assumption that there is some recent national shift in the tactics that the police employ in relation to crowd control. Though this discussion does recognize something important, that the preemptive preparation for rioting seems to be a somewhat recent phenomena borne out of recent events, what is often not recognized is the trajectory that has led to this situation, and how this sort of dynamic has developed. On one hand there is a clear sense in which preemptive preparations are unique outside of a summit demonstration context. But, on the other hand, we have to recognize how expensive, both on the level of resources and personnel capacity preparations like this are. 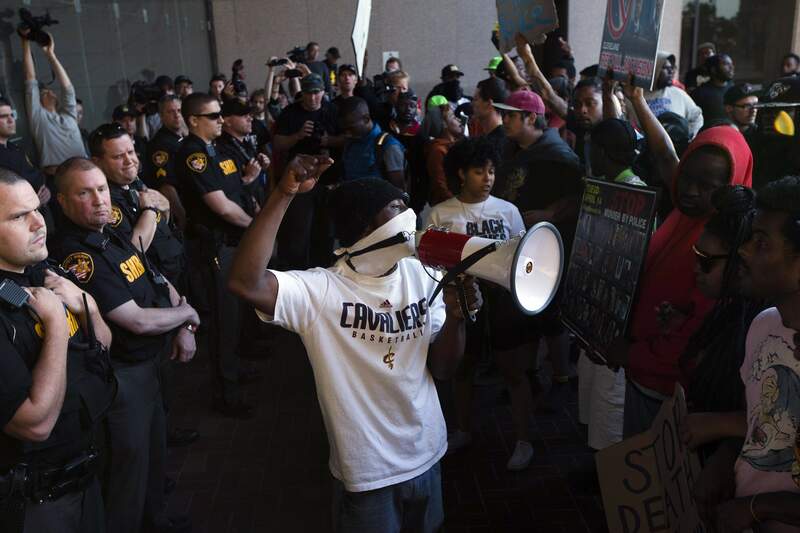 To bring in police around the response to the Brelo verdict in Cleveland, for example, every police department in the county, and a number of departments outside of the county, went onto 12 hour shifts, called off vacations and brought forces into the city. This was on top of the $4 million or so that was spent on preparing a holding area, staffing, food logistics, overtime and so on that was paid. So, even if these preparations are occurring, they are not a sustainable response to the situation. There is a tendency within the anarchist milieu to focus on the confrontation itself in some isolated time frame, as some series of moments that occur in some extraordinary way. But, it is important for us to make sense of the contextual capacities of the forces involved. In this sense what we can say is that these preparations are occurring, and this is a unique situation outside of the summit context, but that this is still a response to something that is seen as isolated, as something that occurs around verdicts and central events that garner a response. On some level this is a response to a recognition. When we think of police forces there is a tendency to think of the moments in which we have interactions with the police, without taking into account the moments where the police are absent, and these moments are important. If we take a police force, subtract the number of police that are on administrative duty, divide that number by the number of districts, zones or precincts exist, and then divide that number by the number of shifts, you can have a rough estimate of the number of police that exist at any one time in the police district that one currently resides, and that is often a relatively small number. This means that the amount of space that is actually covered at any one time is also incredibly small. This is compensated for by the use of vehicles, to increase the rate of movement, the use of radios, to increase coordination and so on. What we are fundamentally addressing is a question of the projection of force in relation to the concentration of force that occurs during response; whenever police forces concentrate at a single point they cover less space as a whole, in less concentration. The discussion around preparations for possible civil disturbance occurs within the discussion of the anomaly, that forces can be concentrated for a limited period of time in order to provide force concentration around areas where demonstrations may occur, while preserving force concentration everywhere else in the city at normal levels. This assumes two dynamics which are also commonly assumed within the anarchist milieu. Firstly, that resistance is always localized to a group that is identifiable and able to be contained in an area, the demonstration model; and, secondly, that the duration of events is confined to a limited period of time. It is in this sense that traditional activist approaches reinforce the effectiveness of this approach to policing, one based in a concentration of force around limited times and spaces. However, there are some distinct weaknesses to this approach, if we can move outside of the activist form of engagement, in which we engage in some symbolic space at some “important” time to make some ethical position known through discursive means we can exploit these weaknesses, but this means doing things in fundamentally different ways. There is a tendency among anarchists, and others within radical milieus, to understand our role at the one’s that confront the state frontally, in some isolated way, and that fighting is defined by clear political ideas and alliances are structured around political identity. This approach accomplishes the isolation that is the condition of possibility for this approach of force concentration to function. If we begin to understand conflict spatially, as something that occurs in space, temporally, as something that occurs along a strategic trajectory, and strategically, where action is framed around the achievement of objectives, if we understand action in its material sense, then it is likely that the model of frontal confrontation in isolated places at predetermined times will become shown to be the absurdity that it is. What this strategy of force concentration has achieved is that it has made the context of demonstrations largely irrelevant, channeled, purely a form of expression. What this opens is a whole other space to begin to make sense of conflict that is not dependent on these concentrated, limited moments of confrontation. The recognition that is coming to the foreground is one that police forces have been attempting to work through since the advent of modern policing, the sheer inability of the forces of occupation to ever project force thoroughly enough over enough space to actually eliminate resistance and “criminality.” Many tools have been used to compensate for this but they all have their weaknesses. One can put cameras all over a city, but someone has to be watching them for the cameras themselves to matter. One can flood a city with cops, but that have to hope that resistance is only a temporary phenomena, and limited to a specific space. In many senses this approach is a remembrance of the limitations of occupation and defensiveness, where the occupying force has to secure everything, but can never have the capacity to do so. It is in this sense that we can approach this phenomena, as a response to an inherent limitation on policing, one that can be, and in many places has been, used to the advantage of insurgents. IGD: Everyday is bringing a new atrocity to the fore in America of police violence. Thinking strategically, do you have any ideas about how people should move forward and act? Tom Nomad: What becomes important here is not necessarily a shift in approach, from one singular approach to another singular approach, but a process of shifting categories away from activist injunctions to engage against perceived injustice, and into a process of making sense of what materially grounded approaches to the logistical operation of policing looks like. It is this question that cannot be answered in general, what this approach is or should be. Rather, this is something that we do all have to figure out, but it is here that some general discussion can be ventured. In other words, what becomes important is not some new approach to action, but an attempt to figure out what activity itself even looks like. For a while now I have been arguing that the question is not what “we” should be doing, whatever this “we” is; this is a question that cannot be answered. We cannot answer this question not just due to the fact that we have to recognize that the only reason this question arises is due to our failure to be successful, but also due to the non-commonality and constantly shifting dynamics of the spaces in which “doing” occurs. Rather, the question becomes figuring out what “doing” means, what are we doing something in relation to, where, when. It is here that some expansion on a discussion can occur, not on the level of doing, but on the level of even being able to understand what doing something means, or whether we should do anything at all, which is still an open question. In order to figure this out we have to realign the posture that many in the anarchist milieu take toward action, which oscillates between feeling a necessity to “do something” and “doing nothing.” Rather, we have to reconstruct the basis through which we even begin to make sense of what this means. To do so we have to come to terms with the spatio-temporality of action, and how confrontation distorts this understanding. In moments of confrontation there is a tendency to develop tunnel-vision, fear, adrenaline and the immediacy of danger tend to generate an understanding of action that is relegated to moments of confrontation, and these become synonymous. In these moments we have to try to maintain an understanding of the terrain in which action occurs. By terrain I don’t mean just physical space, although this is a part of terrain. But, rather, terrain is a term that names the dynamics of the space we exist within, and the forces involved in these spaces, how those forces can be manipulated to generate the strategic outcome that you are attempting to reach and so on. As such, a more general statement can be ventured, but it is in no way an answer to the question of what people should do. Firstly, what this means is that we have to approach forces in terrain as they exist, rather than as we would like them to exist or through the lens of political judgement about those forces. 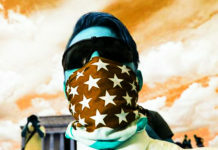 For example, when we take the discussion in the anarchist milieu surrounding working with liberals we are often faced with two false choices; the position coming from insurrectionists, which I have a lot of affinity with on a philosophical level, which is essentially, liberals are forces of collaboration so ignore them or actively oppose them, and an argument that we hear from anarcho-communist mass movement types, the argument that liberals are potential allies and that we need to focus on mass. The question is really a question of whether liberals, whoever they may be, could be useful to the strategic objectives that we have identified as being important, in a local context, or whether they are not, and if they are not whether it makes sense to start a conflict over conceptual disagreement, and what goals that would serve. One could do this with people like city council people, people in the development corporations, insiders in city hall and so on. Before even getting there one has to figure out who these people are, what roles different forces have in an area, and that requires the development of intelligence. The development of an intelligence structure does not just involve getting basic information about possible targets, but also which entities are involved with these targets, how these targets function. It is important to get beyond the idea of the target as a symbolic singular entity, and to understand the target as something that functions, that has people taking actions both within its everyday functionality, but also in the support mechanisms that allow the structure to continue to function in the role it is functioning. To understand this one can rely on information that is in the public sphere, but that is going to be limited. Means have to be developed to find information that is difficult to find, and from there developing an understanding of our environment, and acting accordingly. IGD: Thanks for much for talking with us Tom! Tom Nomad is the author of The Master’s Tools and a member of the Institute for the Study of Insurgent Warfare. Tom has also contributed to Hostis Journal and we encourage people to listen to Tom’s recorded talks here and here.